Spectacular view of Himalayan peaks including Everest. Hike along the longest glacier in the Himalaya, Ngozumpa. Adventurous climb of Gokyo Ri (5357m) for awe-inspiring views of Himalayas and Gokyo valley. Avoid the overcrowded classic trail of Everest region to enjoy more diverse natural views. Explore the magnificent turquoise glacial-fed lakes. Pass villages of Sherpa and insights into Sherpa culture. 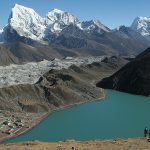 Gokyo Lakes Trek is one of the best treks of Nepal. It offers amazing himalayan scenery and beautiful cultural vision of the local sherpa people. 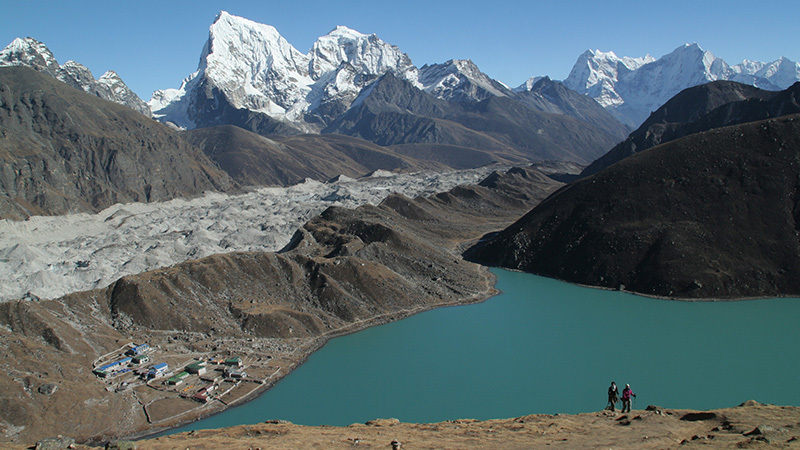 It takes trekkers towards the wonderful Gokyo Lakes.It reveal the complete beauty of mother nature. Similarly it helps trekker to explore the hidden trails within Everest region in just one trip. Adding to that is the lovely Gokyo valley which mesmerize every traveler who visits its amazing lakes and pathways. It starts with a 30-minute flight to Lukla airport from Kathmandu. The trek initiates from Phakding and then continues further ahead to Namche Bazaar. Heading forward, trekkers make their way towards Gokyo Lakes via PhortseTenga, Machhermo. 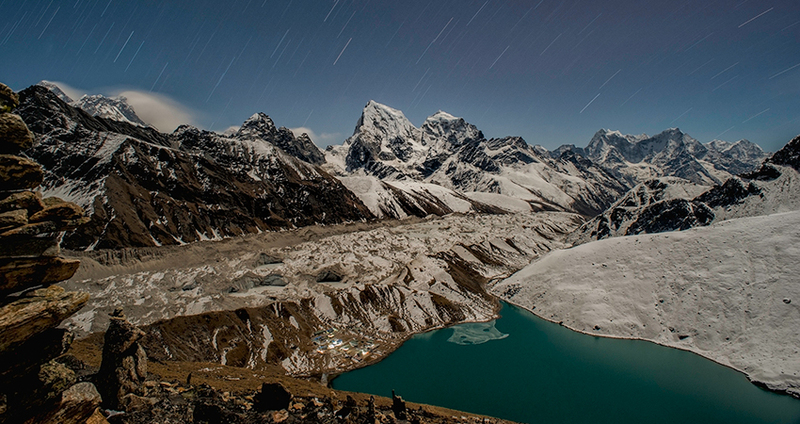 After arriving at Gokyo valley, a mesmerizing sight of Gokyo Lakes captures the eyes of trekkers. And lets them inside the vast world’s highest fresh water lake system – Gokyo Lakes. Last but not the least, a hike up to the top of Gokyo Ri presents trekkers with an unforgettable Himalayan view of the snow capped mountains together with the spellbinding Gokyo Lakes. Contact Euro-Asia Treks right now to join our 13-day Gokyo Lakes Trek and enjoy the outstanding view of the Himalayan peaks including mighty Mt. Everest while exploring the naturally gifted Gokyo Valley. 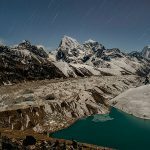 Like with most of the other treks in Nepal, the best seasons for Gokyo Lakes Trek are spring (March to May) and autumn (September to November) considering weather, temperature and clear views. During those times, sky is clear and daytime temperature is warm. However, you can do this trek in the summer (monsoon) and winter seasons too if you prepare well accordingly to cope with the problematic weather conditions and extreme temperatures. 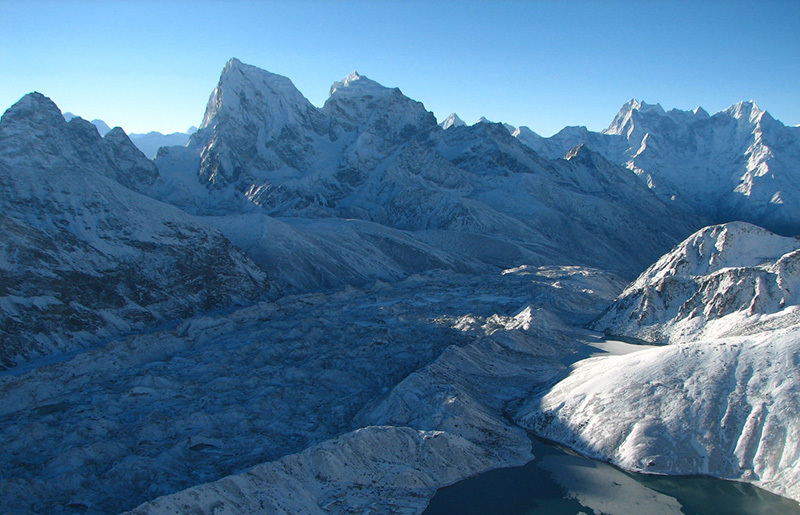 This trek is considered as a ‘moderate’ trek with maximum altitude of 5,360m at the summit of Gokyo Ri. The summit of Gokyo Ri is at around the same altitude as Everest Base Camp (EBC). But it is considered less difficult than EBC as you won’t have to sleep at a high elevation. Additionally, the trek itself is not very demanding & does not require any kind of technical skills. However, a good cardiovascular fitness level with an ability to walk continuously for 4 to 5 hours a day can be very advantageous during the trek. A short 35 minutes of flight to the air-strip at Lukla actually opens all doors to possibilities and prospects of Himalayan exploration and adventure. The Tenzing-Hillary Airport in Lukla was coined collectively after Tenzing Norgay Sherpa and Sir Edmund Hillary, the first human step to successfully scale Mount Everest, in 1998. Attracting many well-experienced to novice mountaineers from all around the world and willing to pay substantial sums for a successful expedition, the Tenzing-Hillary Airport is the gateway to the Khumbu region, and ultimately to Mount Everest. Due to the unpredictable weather in the Khumbu region, almost all flights are concentrated in early mornings. After catching up with the trek crew in the airport and getting updates on various details, the journey continues towards the highest peak of the world. After an hour of walk on a straight trail, a small village of Chaplung is encountered. This is where the main trail from the west meets the trail from Lukla on approach to Mount Everest. The walk continues for another two hours to reach Ghat, and it finally ends at Phakding after an hour more. The day comes to a halt after reaching Phakding and an overnight stay in a local lodge accompanied by great local cuisine, imported and local spirits and hospitality on offer makes you forget the tiredness of the trip for the rest of the day. Day fourth of the trip begins shortly after breakfast, with some catching up with the trekking crew. Trailing down towards the Bhotekoshi River and crossing a long suspension bridge over the Bhotekoshi River, Jorsele is the next destination after crossing the bridge and a walk of about two hours along the straight trail, passing a forest and few villages. Everest National Park check post, located at Jorsele welcomes you to the Khumbu Region and the national park permits are checked. Beyond this point, no firewood is allowed. Following the trail, the path drops steeply, and reaches a long suspension bridge to cross the Dudh Koshi River. Continuing on the straight trail for an hour more, the terrain becomes a bit steep. Going through various difficult terrains, a forest and several other Sherpa villages for almost two hours, the team reaches Namche Bazaar. 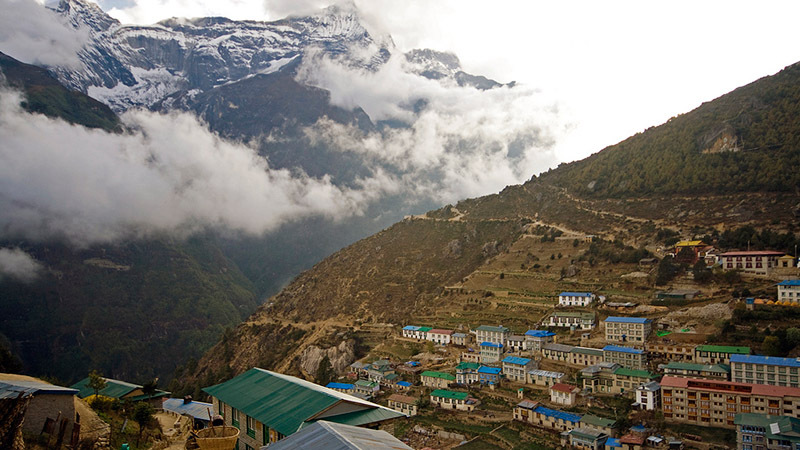 Namche is a great spot for the first close glimpse of the mesmerizing beauty of Mount Everest. The day comes to an end with a warm and hospitable welcome to a guest house by the local Sherpa’s, and the aroma of local cuisine, imported and local spirits, and a beautiful dinner. The day ends in a local guest house with hospitable welcome, good food, great spirits and plenty of rest. Shortly after breakfast, the sixth day of the trip begins with an interesting walk towards Gokyo. Upon the gentle ascent towards Sanasa for two hours, you would trail towards Mong, marked by a Chorten and is in effect a small pass. 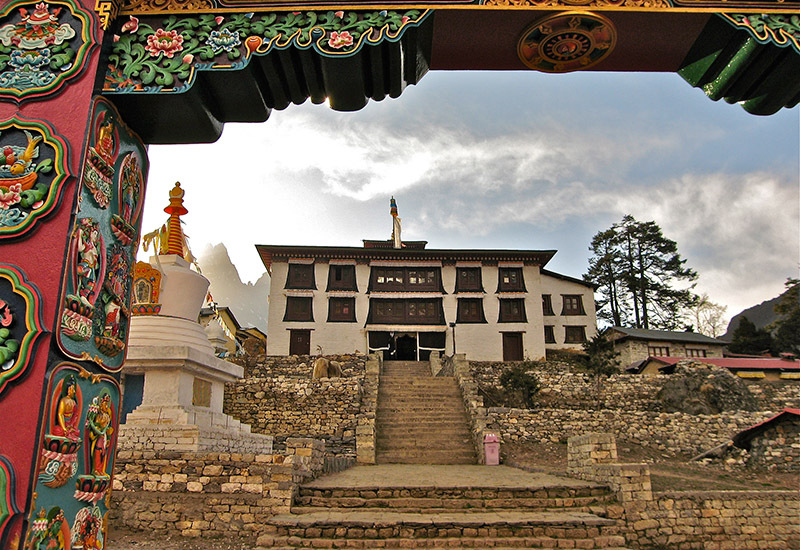 It is famous amongst the local Sherpa community as the birth place of Lama Sangwa Dorje. The trek from the pass towards Phortse Tenga is rather steep, demanding arduous climb. But this steep ascent also has on offer the great views towards Phortse, a spectacular river gorge, and an inaccessible natural rock bridge. Stay overnight at Phorste Tenga. Day seven begins with a gentle climb towards the Dole National Park Check Post, where documentation is checked for the entry into the National Park. A forest trail is on offer after passing the army post at the entrance. Also on offer is the view of some colorful pheasants and shy deer, which leads to you reaching the village of Dole after about an hour of an uphill trek. The trail continues to climb after Dole, to reach out a planar, pleasant traverse with beautiful views. The trip finally reaches Lhapharma, offering snow-capped mountainous views from almost all directions, up, down and across the valley. Luza is an hour trek from Dole and has several pleasant dwellings on offer. After crossing the stream beyond Luza and continuing through the lush fields, you would reach Machherma with tantalizing views. This day marks the visit to the Gokyo Lakes at an altitude of 4,750 meters. The trail ascends towards a ridge with amazing views of Mount Kantega across the valley and Mount Cho Oyo, far north. The trail passes through Pangka to a river crossing before beginning the ascent along the moraine of Ngozumpa. At this stage you will pass the first of the three lakes to Gokyo. Trekking across the Dudhkoshi River, the next step is to climb the ridge at Tengboche. 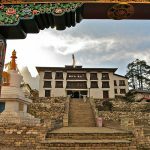 Tengboche is home to an internationally renowned Buddhist monastery which supports up to 60 monks. If time grants, a visit to the monastery may be worth a consideration. Tengboche is also a popular viewing platform with spectacular views of Ama Dablam, Nuptse, Lohtse and Everest standing tall far up north. Immediately east of the camp is the view of Mt. Kantega, standing at 6,685 m. Towards the south are Mt. Thanserku (6,808 m), Mt. Nupla (5,885 m), Mt. Kongde Ri (6,187 m), Mt. Khumbi La (5,761 m), Mt. Tawack (6,808 m), Mt. Nuptse (5,885 m), Mt. Everest (8,848 m), Mt. Lhotse (8,501 m), and Mt. Ama Dablam (6,856 m) in a full circular swing. The quickest route from Gokyo to Phortse is backtracking via Dole and Machhermo, but there’s also an alternative route on the eastern valley wall leading directly to Phortse via Nah La. Aiming for the small bridge, you will head towards a narrow trail, barely visible from the other side of the valley, but it’s visible when you reach there. Following the faint trail, a short climb leads to a Chorten (4278 m) with magnificent views. Following the Chorten on the path is Konar, which is used as a large hay growing area in summer. All trails around the corner from Konar lead to Phortse. Following the trail dropping from the southern corner of the Phortse village is a small bridge, accommodating to the pathway for the steep climb towards Tengboche. This trek is about three hours long and one may get the best glimpse of the Himalayas including Mt. 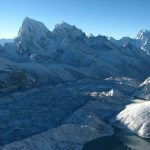 Everest, Amadablam, Nuptse, Lhotse, Thamserku and Kangi Tenga, and an opportunity to spot local animals including colorful pheasants, Tahr and Deer in the region. The end of the descent is heralded by a Kani, an arched entrance with ceiling paintings of deities and forms of Lord Buddha, which is believed to cleanse people of the many feared spirits before entering the sacred region in the Himalayas. The trip leads towards the Kyanjuma foundation and Choi Gang after the suspension bridge across the Dudhkoshi River is crossed and finally reach Namche at the end of the day’s trip. Yet another four hour trek from Namche to Phakding via the Everest National Park check post at Jorsele and crossing the Bhotekoshi River yet again. The day ends in a guest house in Phakding. This trip marks the end of the trekking trip on return to Lukla and takes about four hours. Going across Ghat again, you will walk across the trekking route intersection at Chaplung, and reach Lukla to end the day’s trip in a guest house. Flight from Lukla to Kathmandu, and transfer service to the hotel upon arrival at the airport. The rest of the day is off for leisure. 13 Days trek as per program with English Speaking Sherpa Guide and Porter.